The photograph that led to Gurmehar Kaur being put under 24-hour police protection was taken by her best friend on a camera phone in her university dorm room. The simple colour shot shows her holding a placard saying she would not be intimidated by a rightwing group she accused of disrupting her college. Only hours after she posted the image to Facebook, Kaur, a 20-year-old English student at Delhi University, found herself at the centre of a national debate that, for weeks now, has fed television shows, news stories and editorials and has involved politicians, film stars and the former captain of Indias cricket team. The debate has thrown into the spotlight not only the issue of online abuse but also the political climate in India where universities have become key political battlegrounds and where powerful rightwing student bodies have mass political support. The story of Kaurs domestic incarceration has its roots in a video she appeared in last year that briefly led to her becoming becoming a minor viral sensation. She made the four-minute clip in which she recounted the pain she felt over the death of her father an Indian army captain who was shot on duty in the 1998 Kargil war between India and Pakistan. The video proved to be both provocative and enlightening because it was open and honest about her feelings she said that until recently she had hated all Muslims, blaming them for taking her father away from her. In that video she had again used a placard to make a point about the need for peace, stating at one point Pakistan did not kill my dad, war killed him. The YouTube video and the Facebook photograph were meant to be unconnected but they soon became entwined. Within minutes of posting the picture, her phone had started buzzing. At first, it was just likes and friendly comments from supporters but soon a flood of angry messages poured in. Nationalists were furious. They were searching for details of her life, unearthing the video from last year and using it to attack her. One man said Kaur was leveraging her fathers death. Others called for the 20-year-old student to be raped or murdered. Kaur was at first unflustered. Critics of the Akhil Bhartiya Vidya Parishad (ABVP), the rightwing student organisation she had singled out, often face an army of online trolls, many of whom have the Indian flag or Hindu iconography and slogans on their profiles. But soon people were posting images that parodied the video she made about her father. Photos of Osama bin Laden carrying the tagline Did not kill people, bombs did, or of Adolf Hitler with the slogan Did not kill Jews, gas did spread across Twitter and Facebook. Soon celebrities joined in. A government minister went on national television and said Kaurs mind has been poisoned . 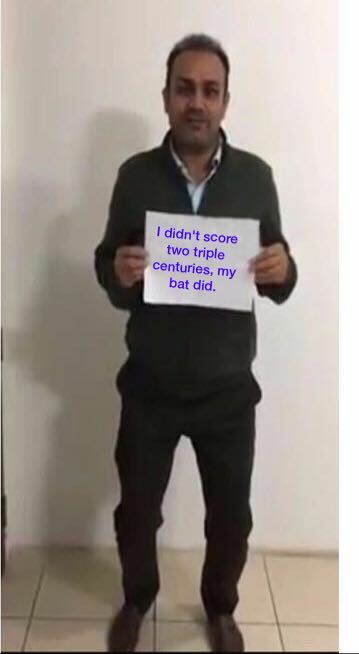 Virender Sehwag, former captain of the Indian cricket team, posted an image of himself carrying a placard that read I did not score two triple centuries, my bat did. The Bollywood actor Randeep Hooda also joined in, tweeting that Kaur was being used as a political pawn. It was heartbreaking, Kaur says. It is so sad to see some one you admire saying these things about you. Hoodas message, Kaur said, devastated her, because she had been a fan of his films. She wrote back, saying: Really sweet of you to encourage the hate Ive been receiving. Hooda later apologised saying: In hindsight, I do believe should have been more careful. I have been receiving an enormous amount of hate, Kaur tells the Guardian, speaking from her home outside Delhi where she is waiting for the political row to die down while under police guard. I dont understand why. People are making memes about me, trolling me. Ive stopped checking my phone because it would kill me. It makes me sad that this is how people think. Why is there this whole environment where its OK to tell girls youll be raped if you voice your opinion? Part of the reason for the intensity of the backlash against Kaur can be put down to the political climate in Indias universities. While, in the west, campuses tend to be hubs for liberal and leftist views, Indias rightwing student parties have mass political support. The ABVP is widely considered to be the youth wing of Narendra Modis ruling Bhartiya Janata party (BJP) and is riding high on the prime ministers popularity. It is now the worlds largest student organisation with more than 3 million members and wins student elections across the country. The organisation acts as promoter of Hindu nationalist ideology on campuses. Members have been accused of violence and bullying. Last year, a Dalit (untouchable) student at Hyderabad University committed suicide after an apparent row with the ABVP, who allegedly labelled him an anti-national. Previously, members have been accused of beating up university professors and staff, preventing film screenings and gagging academic debate. The ABVP denies that any of its members are violent or abusive. For Kaur, the rise of the group at her university was alarming. She had posted her controversial photograph after her friends, members of a rival student party, alleged they were pelted with stones and beaten with iron rods during a demonstration to allow the controversial speaker Umar Khalid to speak about his PhD at the university. Khalid, who has voiced support for Kashmiri nationalism in the past, is branded an anti-national by the ABVP. Perhaps the irony is that, a few years ago, Kaur would never have defended Khalids right to speak freely. For her, the conflict between India and Pakistan over the disputed territory of Kashmir is deeply personal, one that took her fathers life. I was only two years old when my father died, she says. I grew up believing all Muslims and all Pakistanis were responsible for his death and so I hated them. I loved India and I hated anything that was not Indian. When I was at school, they taught us that the British colonised us. So I hated Britain. I hated any flag that wasnt the Indian flag. I would fly into a rage at the sight of a foreign flag. Aged six, and traumatised by her fathers death, Kaur had tried to stab two Muslim women dressed in burqas. I was at the market with my mother, she says. At that time, I couldnt differentiate between Muslims and Pakistanis. I just thought they are Muslim so they are bad. I picked up a knife that one of the vendors had and I ran towards them. In my mind, I was thinking, I have to kill them. When youre six, you dont understand geography, you dont understand religion. My mother held me back and just looked at me. Thats when she understood how much toxicity there was in my mind, how much hatred. It took years but Kaur learned to reject the hatred she felt. Last year, she interned with the production company Handloom Pictures, which decided to make a video about her story. It was just something spontaneous and unplanned, she says. The point I was trying to make was very genuine and deep. It took me 18 years to overcome the hate I had felt as a child and I made that video because I dont want other girls to go through what I went through. Then, this year, Kaur decided to take on the ABVP because she felt the safety of students on campus was threatened. University spaces should not be terrifying, she says. We go to college to learn things, to have discussions, to watch plays, to hang out at the canteen. Saket Bahuguna, the ABVPs national media convener, says that Kaurs allegations against the ABVP are not backed by any evidence. She cant prove that its ABVP members who are trolling her, he says. I dont want to comment on her video. Speaking on behalf of ABVP, none of our members are involved in this. We have even lodged a police complaint, asking them to arrest anyone found threatening her. She should not blame us. The torrent of abuse, however, hurt Kaur deeply. A week after she posted the picture, she sent out another tweet, now to her tens of thousands of followers. I am withdrawing from this campaign, she wrote. Congratulations everyone. I request to be left alone. I have been through a lot and this is all my 20 year old self could take. However, she does believe her campaign has had a effect. I dont know how I ended up here, how I ended up as the centre of so much attention, she says. I guess if it gives me a louder voice to spread my message, then OK, Ill take it.